Getting our client out of jail fast is our top priority! Getting our client out of the Tavares Jail - FAST is our top priority! Call our bail bonds service 24 hours around the clock! We will begin our simple bail bond process and evaluate how we can best serve you as our client. We are specialized in Tavares bail bonds requiring no collateral. Our bail qualifying is quick and simple. Call our bondsman around the clock. 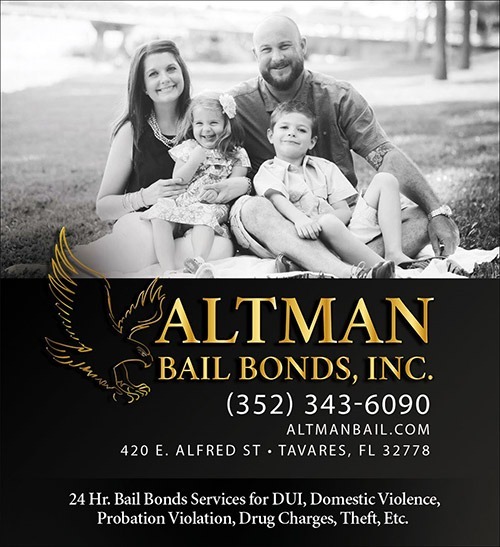 Once the qualifying questions are answered, and the bail bond premium fee (10%) is expalined, our Bail Bondsman move fast to post the bail at the Tavares Jail in Lake County, Florida. Our Bondsman are local and minutes from posting our client's bail bond at the County Jail. We post the bail minutes after the qualifying process is complete. This will allow the Lake County Detention Center to begin the release process while you're on the way to our bail bonds office, located close to the jail. Customer service is a must, and our goal is a fast release from jail on bond. We take unique steps to ensure less waiting for our client's. “A timely release from Lake County jails is my top-priority. This unique feature will ensure short waiting times for our clients, and peace of mind." Call Us 24/7 To Get Out of Jail!